Judaism is a religion deeply rooted in sacred texts and textuality. 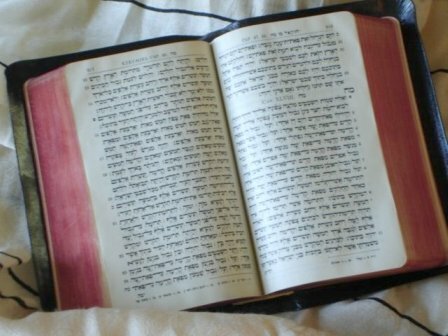 Therefore, the texts of the Torah and the written interpretations of them are very important. The term "Torah" refers most basically to the Jewish law that is found in the Hebrew Bible. However, the term can be used very narrowly or very broadly, depending on the context and who is speaking. Sometimes the term refers only to the Pentateuch, which is comprised of the first five books of the Hebrew Bible: Genesis, Exodus, Leviticus, Numbers and Deuteronomy. Inside these books is contained the summary of the Jewish law, called the Ten Commandments, as well as the full listing of the 613 commandments that most Jews list as making up the heart of Jewish law. The term also can be used to refer to the entire written Hebrew Bible, or the "Tanakh". The term "Tanakh" comes from the three main consonants that make up the word - T, N and K. T stands for Torah, N stands for Nevi'im (meaning "prophets"), and K stands for Ketuvim (meaning "writings'). These three - Torah, prophets and writings - make up the major divisions of the Hebrew Bible: the Pentateuch, the books written by prophets (like Isaiah, Jeremiah, Ezekial, etc.) and the writings (like Psalms, Proverbs, Song of Solomon and others). Finally, the term can also be used to refer to the entire Hebrew Bible as well as to the Talmud, which is made up of a few centuries of rabbinic commentary on the Torah. Those using the term in this way sometimes divide Torah into 2 sections: the written law (the entire Hebrew Bible) and the oral law (the Talmud). So, the Torah is a central part of the Jewish religion, and it means different things to different groups within it. Some of the main differences between Orthodox, Reform and Conservative Judaism come from their diverging views of it and its meaning.